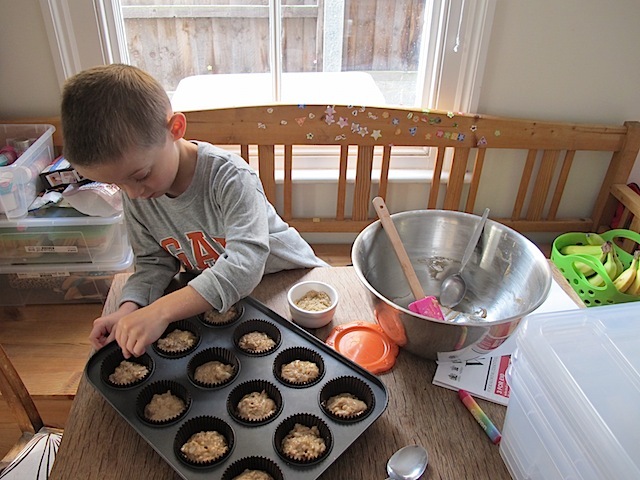 Ted and I have spent a lot of time in the kitchen during half term – albeit at the expense of a hideously overflowing in-box that’s going to have to wait until next week. This post is short as we have my dad staying this week and he would kind of like to go to sleep soon. We’ve been entertaining other family members all afternoon and I’m wiped out from cooking and seriously behind on email backlog. 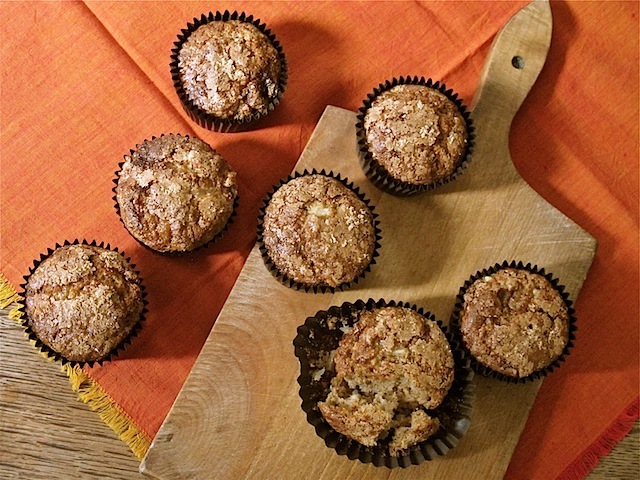 These pear and ginger muffins came about because I had a bag of overripe pears but by the time I came to make them, the pears had really had it but I’d psyched myself up to make pear and ginger muffins. So I had to buy new pears!! Ted’s sprinkle of soft brown sugar on the top really finishes them off. It was Helly‘s idea to use spelt flour instead of normal flour. 1. Preheat the oven to 200c /gas mark 6. 2. Sift the flours, baking powders, bicarbonate of soda, salt and sugar into a large mixing bowl. 3. In a small bowl or jug, stir the egg, oil and extract. 4. Fold the fruit and ginger into the flour mix. Fold in the wet ingredients. 5. Spoon into the paper cases and bake for 15 minutes. 6. Allow to cool in the trays for a few minutes before transferring to paper cases. 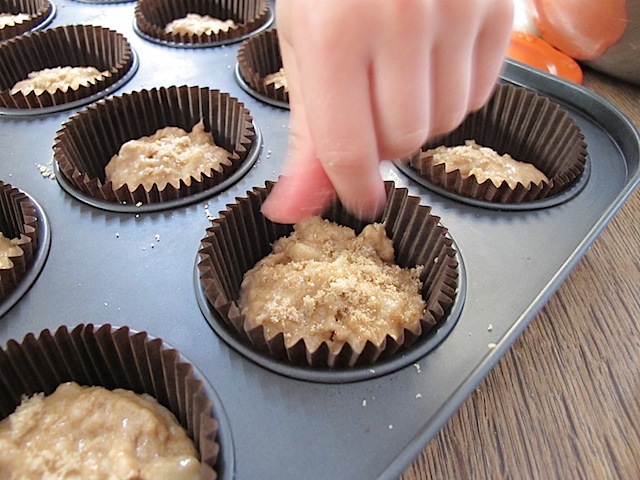 Although muffins tend to crumble if you pull the cases off them when they’re warm, they taste jolly nice straight out the oven! They look lovely Sarah. 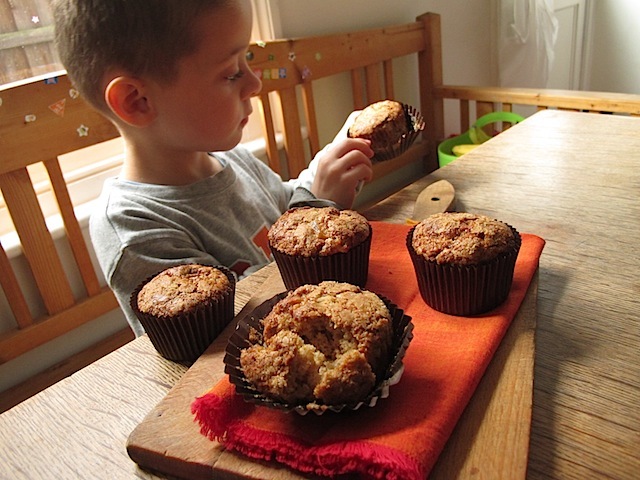 I find that spelt makes everything more cakey and inclined to crumble. I haven’t baked with spelt flour so far, so it’s time to try something new! It’s worth trying, you can get it in Sainsbury’s and I understand most coeliacs can tolerate it even though it’s not strictly gluten free. Oh they look wonderful. Can you save me one ? There is one in the fridge waiting for you! Thanks! I have only managed to get on here for a few minutes at a time unless he’s in bed then I’m too tired to do much! Same old story! These look delicious! I would love to share this recipe with our readers. Could I have permission to share or at least link to this? Thank you!